"Yes, my siblings and I grew up in a pre-World War II rural residential environment, where there was room to have a variety of plants. In addition to fruit plants, and a large vegetable garden, there were landscape shrubs and some beds of flowering plants. Both our parents came from family traditions wherein one raised a large garden and maintained food animals, doing home butchering and food preservation. My mother and her mother both maintained beds of self seeding annual and perennial herbaceous flowering plants, as well as flowering shrubs. I did a lot of reading in those years including poring over seed and nursery catalogs in season. Competing with my entries from 4-H and Vocational Agriculture projects helped to cultivate my appreciation for producing quality items." "With plants, about 1958, while employed by University Extension in Maryville, Missouri, after it became practicable upon gaining continuing access to some growing space (by marriage). A couple of years before I had been introduced to the idea of doing peony breeding by Leola ‘Missie” Bainum, a Maryville Garden Club member who had some of her own select peony seedlings, one a fine show winner. However, I first dabbled with tall bearded irises and hemerocallises, of which I still grow one of the hems from 1963 crosses. My first peony crosses were made in 1967, a few years after my employment had taken me to Kansas City, Missouri." "I investigated back garden plant breeding upon failing to find further employment in my first chosen field, beef cattle breeding. After my 1948 BS in Agriculture I had jobs with pedigreed beef cattle in New York, then Texas. In 1954 I accepted employment with the University of Missouri Cooperative Extension Service. Soon I picked up on ornamental plants breeding at home, first exploring irises and hemerocallis. However, I soon concluded there were so many people introducing costly new cultivars of irises and daylilies there wasn’t much chance of competing in those venues short of investing sizable sums to buy into state of the art breeding cultivars, something I did not have available. 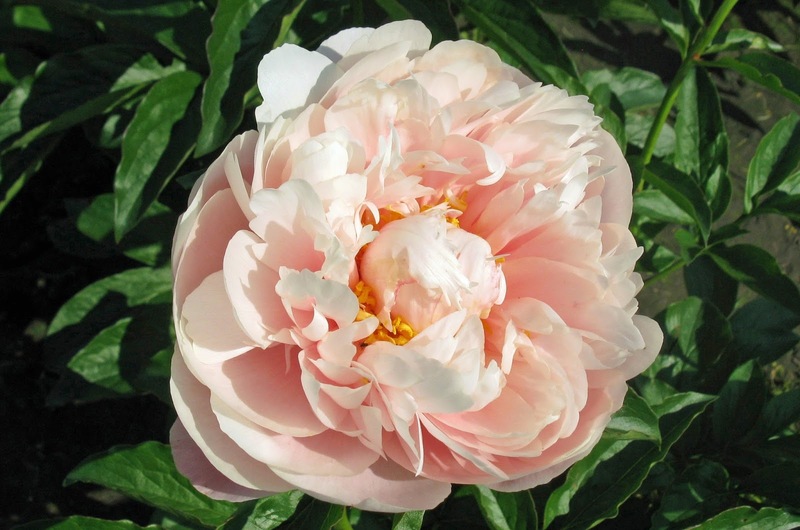 The frustration with those venues was resolved when I learned Silvia Saunders was cultivating interest in peony breeding and as a part of which making available promising cultivars which had resulted from her father’s projects, selling for token prices to breeding interest customers." "First I had grown up in a family environment in which choice sorts of domestic plants and animals were appreciated, including appreciation of the selective breeding by which those had been produced. Then in secondary school biology class I was introduced to the significance of Gregor Mendel’s discoveries. Later, at University of Missouri my undergraduate program consisted of two broad thrusts: physical sciences and general agriculture production, plus agriculture business, with special study in breeding science and technology. That was the beginning. In 1961 my Extension Division employment took me to the then recently established University of Missouri-Kansas City, the campus of which is located adjacent to the internationally patronized Linda Hall Library of Science and Technology. The former offered access to the U of MO System Libraries, as well. A further benefit, the private library has a 14 acre grounds maintained as an arboretum, including an extensive collection of herbaceous peonies and, eventually, woody peonies, cared for by a groundskeeper who was as interested in plants study as myself. (Fred Leimkuhler was absolutely unique in my experience in his project of breeding inter-species hybrids of oaks.) At the Linda Hall Library I could pick up on peony research in Horticulture Abstracts, then consult the journal in which the research report was published. 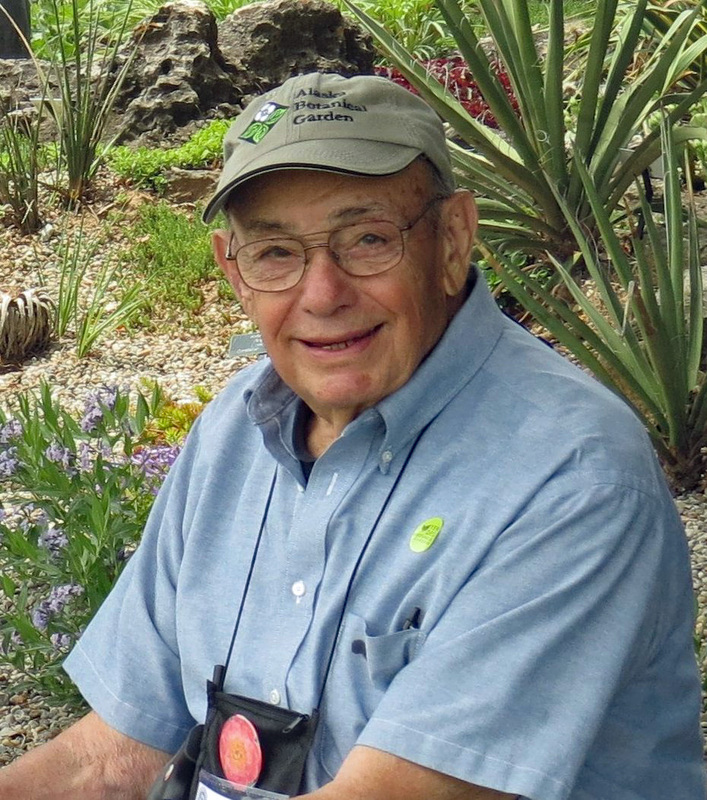 In the late 1970s I enrolled in plant biology graduate study – mostly in plant taxonomy study, but with related course work in plant physiology and ecology, as well." "Deliberate crosses, the parents chosen for their potential to contribute to study interests and to progress toward my breeding goals. By “deliberate” I mean the crosses are made with a purpose in mind, not just willy-nilly. While opportunity (what is flowering when I have the desired pollen in hand) plays a role, the choice of matings is, even so, almost always mindful. This is not to say accidental achievements do not happen. For example, sometimes because I collected open-pollinated seeds from a favored seed parent, sometimes because of contamination of a cross by stray pollen, “stray” meaning unintended contamination of an intended cross - it is a challenge to absolutely protect a peony cross against contaminating pollen." "In the early years much of the effort went toward studying the germination protocols and variation in growth habit between different species ancestries, along with how the peony grows, in general, including in particular the topics of dormancy, resistance of early buds to freeze damage, and how a species evolves and is adapted to survival in its natural environments. One outcome of these earlier years study is that I wrote regularly for the peony hybridists quarterly and for the APS Bulletin. In later years, during the time I was operating the retail nursery, I have been concentrating on transferring doubleness into the first three flowering periods – Very Early to Early midseason. More recently, upon visiting the recently developed late season cut flower enterprise in Alaska, I have been thinking about some approaches to breeding white flower cultivars which do not go blush/light pink when the flower develops in a cool environment and to increase the range of appealing double flower cultivars which open satisfactorily from buds cut before the petals are so much unfurled as we cut for show table competition where the flower must complete opening overnight. Production for florist use requires flowers which can be opened by the end users from buds in which the petals have remained well protected from injury by the bud covers." "One’s “eye” meaning what one is looking for, evaluation of the phenotype? 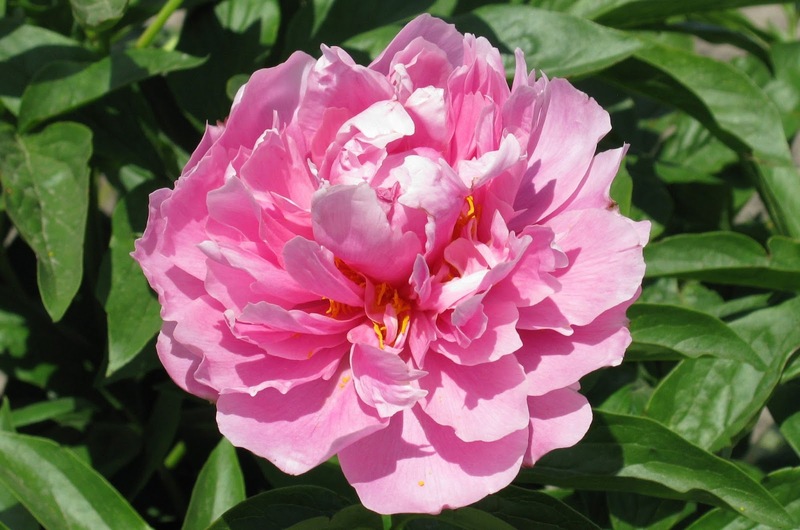 Whereas when I started I was focused primarily on the flower character and interspecies fertility, as experience and contact with other peony breeders informed me, the significance of characteristics needed for commercialization and end user benefits have gained appreciably in my priorities. If observing an introduced plant or one of unknown provenance, then what does it perhaps offer to further breeding. Perhaps the biggest factor as my “eye” evolved was when I became involved in the retail offering (1992, ff). Crafting the Item descriptions does focus one on what is good about the plant for the end user, meaning to be sure to present the cultivar advantages, but also mentioning any significant faults inherent in the subject cv., such as need for support if flowered in a viewed landscape or subject to late freeze damage, as in erratic spring warm-up climates." "The ornamental qualities and harmony of plant and flower as a whole (landscape end user viewpoint), vigor and overall performance in relation to conditions provided by the growing environment where observed, characteristics supporting cut-flower potential, these assets in light of whether the subject plant offers potential for introduction to commerce. Also, in the case of other breeder seedlings and plants of unknown history, what might they contribute for further breeding or for introduction or re-introduction. Probably it was after I commenced commercial offerings in about 1992, I began to realize it is a given that if a cultivar is going to outlive its creator, it must succeed in commerce on its own merits." "First, strong performance and the flower class with its potential for competitive beauty, in its season of bloom. Second, the plant habit with respect to the potential end use. Then, when judged less than competitive in one or both of the previous considerations, does it have potential for further use in breeding – the basic rule in breeding is to mate best to best and watch for progeny that have levels of important desired characteristics to a greater degree than seen in the parents." 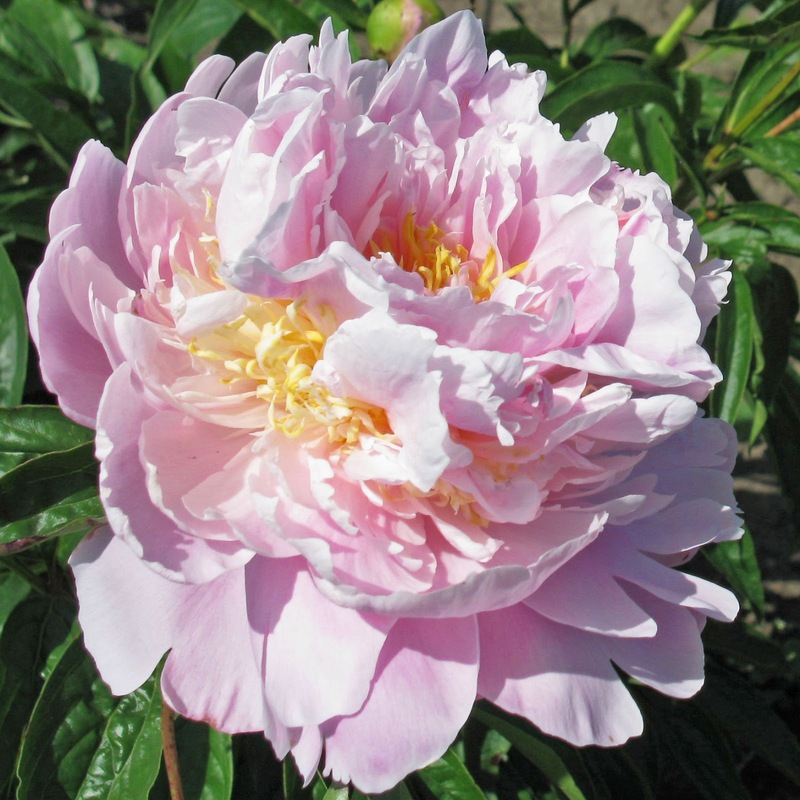 "That peonies become ever more widely appreciated (and desired) by the gardening public and the private vendors and services they look to for support of their gardening interests. And, that florist production becomes ever more appreciated by the florist trade with associated gains in demand. The path to both will be somewhat eased by the rate of success achieved by peony breeders." "So far it is ‘Garden Treasure’. Its overall range of ornamental attributes and its top flight performance. 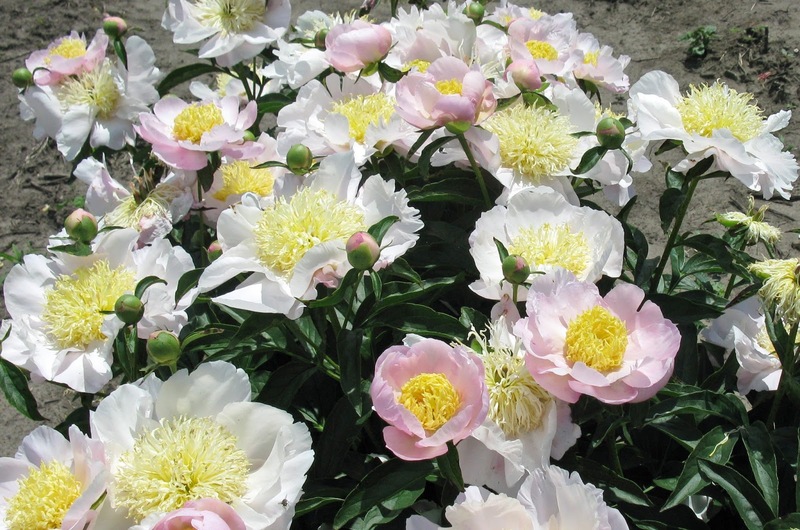 Its vigor is superior, among the most resistant of fungi among the garden peonies, widely adapted in regional climates when typical peony growing needs are met. Unlike any other peony cultivar known to me it opens flowers over an extended period, two and a half weeks or more in my regional climate where spring heat pushes peony flowering, up to four weeks or more at more northerly sites, such as Minnesota and northward. 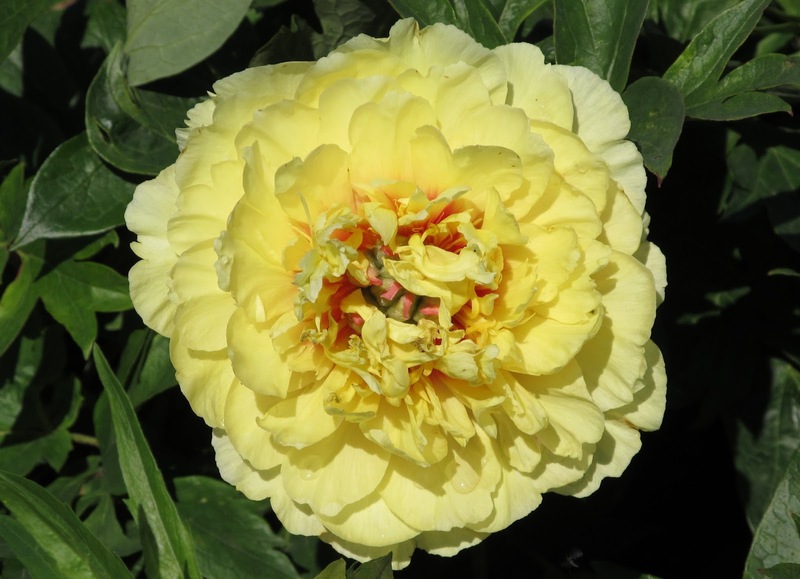 Hardy and performs well in the harsh climates of Saskatchewan and Alberta in Canada. It is highly suited for landscape applications and fields of it are producing for the florist trade in the both the Northern and Southern Hemispheres, said to be the only Itoh Hybrid suitable for the purpose. Semi-double to Double flowers are well formed, golden yellow, deep green attractive foliage compares well lasting through the summer with the better Lactiflora cultivars in this respect. More personal, it resulted from a cross I made in my second season of breeding peonies, 1968, and jumbo divisions sell retail from reputation growers for $60.00 and more." "Defining my “oldies” arbitrarily as those registered any time before 1995, the first registered having been in 1984, in alpha sequence: ‘Color Magnet’, ‘Delaware Chief’, ‘Early Glow’, ‘Garden Lace’, ‘Garden Treasure’, ‘Lorelei’, ‘Many Happy Returns’, ‘My Love’, Prairie Princess, ‘Show Girl’, ‘Summer Glow’ and ‘Sweet Melody’. That is 12 of 16 registered during that period. Of the other four, all are excellent performers and the flowers are appreciated by customers, but in my view get a demerit for some plant or flower habit. Only one has been discarded, ‘Pink Crescendo’, vigorous with a big doubled flower that is too often disfigured by late freeze damage during bud development." 13. Which of your new registrations are you most excited about? "In the last five years, oldest to newest, ‘Kathy’s Touch’, ‘Nelda’s Joy’, ‘Pearl S. Buck’ and ‘Early Canary’." "There were six of them in 1984. ‘Garden Treasure’ genesis offers the most interesting story. It was a struggle to get the parts together to make the cross. The story: By 1967 or so I knew the history of the four Louis Smirnow introduction of the yellow flower hybrids plants bred by Toichi Itoh of Japan, (a Lactiflora cultivar X pollen of Lutea Hybrid ‘Alice Harding’). A year or so later I determined to repeat the cross, but I did not have the pollen in sight. 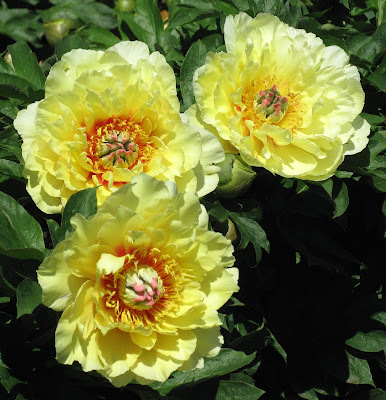 I wrote to the garden editor of the Kansas City Star, who also did landscape design services, expecting he might be a better than average source of where peony ‘Alice Harding’ might be found in KC gardens. He did not know, but when his weekly newspaper column appeared the following Sunday, the subject of his column was my story and appeal. I did not expect much from it, but to my delight a few days later there surfaced a fellow in Independence, a suburb on the eastern fringes of the metro area, pleased as punch to know he had something rare. I had my pollen, but meanwhile my peonies were all bloomed out. A few days later was the Memorial Day holiday, and our annual trip to Maryville to visit my wife’s parents, right here where I live now. Along the driveway were very old peonies, one of which had a few sidebud flowers remaining, to which I applied my pollen. That autumn I collected five seeds, three of which were germinated indoors over winter and in time made leafy shoots. When planted outside to grow, within days some worm-size beast managed to cut through the root on one of them, resulting in its loss. Of the two remaining, the best became ‘Garden Treasure’. It made excellent growth the first year, was moved the first autumn, made the second season of growth and flowered the following spring. Within a few years it became evident we not only had achieved one of the first American bred Itoh Hybrids, but one that is especially healthy and having an unprecedented length of flower opening period, two and a half to four weeks or more, depending on how hot the spring warm-up." "A relatively long time. Having an abundance of space to hold seedlings while increasing them is a contributing factor. Introduction depends on having increased a candidate to a desired quantity. My practice has been to not register a name until we decide to introduce it in the upcoming annual catalog. When seedlings first flower or within a season or two some will be selected for further observation. We have normally divided and grown to maturity for at least two cycles before any decision to cull. Re-selected items are then grown in propagation cycles, pending a decision to name and introduce." "Various. The names I choose are intended to avoid cutsie stuff. I do take the chore seriously, rarely resolving the question “on the spur of the moment”." "‘Garden Treasure’, ‘Many Happy Returns’, ‘My Love’, ‘LaDonna’, ‘Lorelei’, ‘Summer Glow’, ‘Show Girl’, ‘Pink Teacup’" That is an interesting question. The simple answer is no, perhaps following from the fact that I am more conscious of being gratified when one of my originations earns popularity. Somehow the elements leading to the possibility of surprise seem to have been relatively insignificant in my perspective on breeding and new cultivar origination. "Their successes validate my faith in the findings of breeding science and the application of what we learn therefrom." 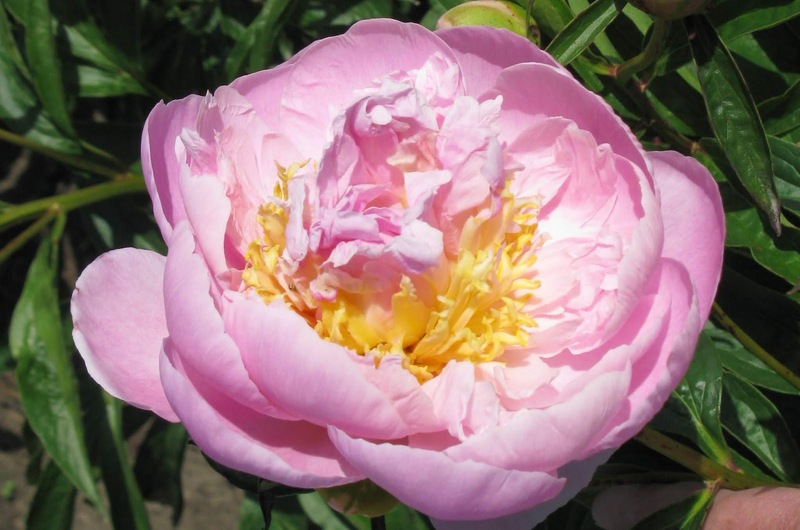 "Yes, I reckon it happened because breeding peonies is a long term proposition. Keeps one “at it” in the beginning. Then, when some things appear that pleases, the satisfaction grows." 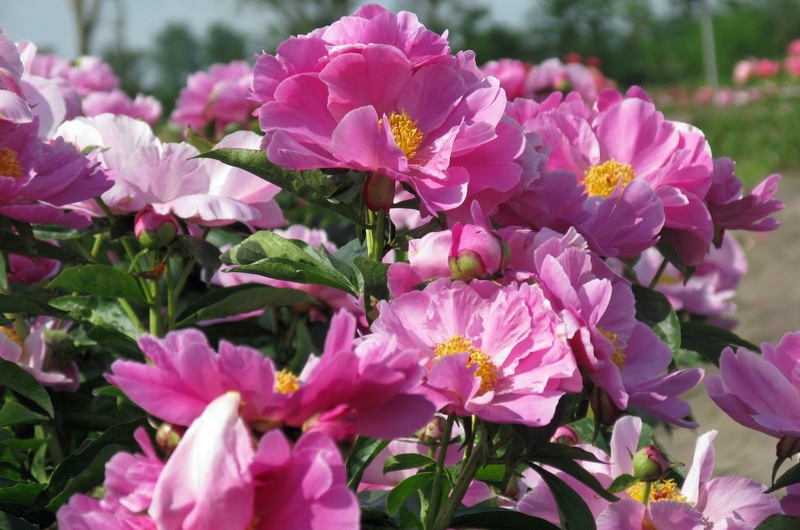 "Peony breeding is a great creative outlet and offers pretty much a level playing field, very little big operator competition. The investor money goes to species which afford a quicker turnover. We compete with hobbyists and sometimes small retail growers Getting started need not require a bunch of cost. For most of us we at first did some crosses of opportunity, just to see what happens. No detailed study necessary beforehand. However, when the first ventures turn into enthusiasm, study becomes a valuable tool. 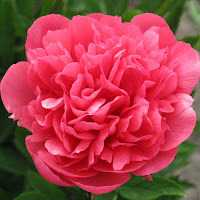 Look at the titles offered at the web site www.AmericanPeonySociety.com. 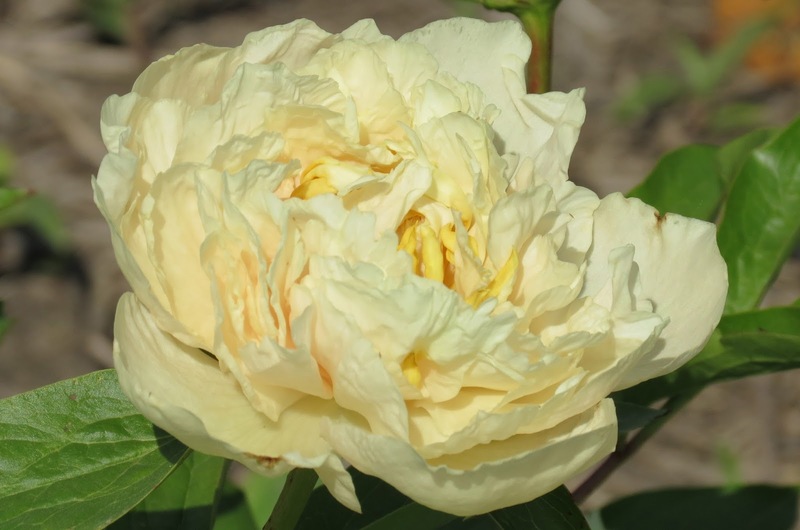 Also, have a look at the Yahoo groups peony breeders and join the American Peony Society for current information on new cultivars being registered by breeders who have been at it for a while." Really enjoyed reading your interview, Adriana! I met Don Hollingsworth at the 2014 APS convention, one of the highlights of the trip. And I'm glad to say I grow the majority of the varieties Don mentioned above--now just have to concentrate on those last few! His focus on plants with buds that weather late freezes certainly is one of my chief concerns as well. Although I have several Hollingsworth introductions I never focused on the breeder specifically; just the beautiful picture of the flower. After reading this interview I'm going to focus on collecting even more of his introductions! Thank you for such an informative feature, hope you continue with the series! Thank you for the kind words. Yes, I too like to collect the work of particular breeders. It is fun to get a bit of insight into their goals and aspirations. 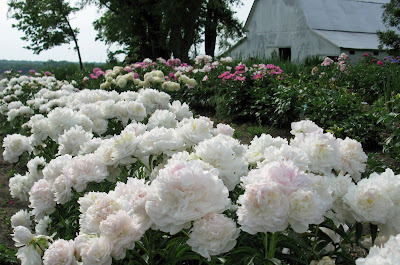 I found a few Hollingsworth peonies to add to my list as well. I definitely plan to continue this Peony Hybridizer Interview series, and already have the next interview in the works. Stay tuned for more! 2016 First Intersectional Peony Seeds!